You can make still or flowing water features in any model scale using simple techniques based on dry florist's foam and clear sheet styrene or acrylic. There is no need to use noxious chemicals to create the water effect. Acrylic artist's mediums are used to create a textured 'water' surface on top of sheet styrene or acrylic, available from model shops, online or from some framing shops. The basic technique involves creating the underwater scene on shaped dry floral foam, sections of which can be glued together before shaping if you need a long feature for a model railroad layout. Once the underwater scene is created, the area is 'landscaped' into the floral foam, and a sheet of textured clear plastic or styrene is laid on top of the water feature glued into position and landscaped to disguise the edges. Take a look at all the steps for how this dollhouse scale koi pool was created, then plan your own still or running water features, in any size or scale. Just make sure you use clear sheet plastic or styrene that is thick enough it will not bend in the middle when laid over your chosen water feature. There are instructions to make miniature koi from polymer clay, as well as making water lilies from paper. This technique is especially useful for simple water features like scale swimming pools and water hazards for model horse jump scenes. Dry floral arrangement foam, available from florists or craft stores, is easy to carve material which will hold wire landscaping materials easily. It can be finished with a coat of gesso to protect it from dents, and shapes can be adapted if your model changes in the future. Straight polymer clay blades work well to make slices of foam for thinner display pieces. This koi pool was built in a piece of foam just under 1 inch thick. When finished it can be glued into a larger garden of similar pieces, or used to create a stand-alone water feature. If you need pieces of floral foam larger than the ones you can buy, cut the pieces to your desired thickness and glue them end to end with PVA (white) glue. For larger scenes, glue all the pieces of floral foam to a solid base, then carve your landscape details, including water features, with regular sculpting tools and loops including ribbon tools and clay cleaning knives. As you can see in this simple model pool made with melted plastic 'water', the basic floral foam shape needs to first be coated with a layer of gesso or thick tube acrylic paint and left to dry. Once dry, you can paint the entire surface of the pool with a layer of basic 'mud colored paint, then begin to add landscaping details. In the case of this particular pool, which I wanted to resemble the standard backyard fish pools, I painted the pool a deep gray, then dry brushed the sides with green and brown paint. Darker paint colors will make the pool look deeper and shadier. Color the areas of the pool which you want to appear 'deepest' with your darkest shades of green, blue or brown, depending on how you want your final pool to appear. When the paint has dried on the interior of the pool, glue your landscaping (in this case coarse sand) to the base of the pool in a thin layer. Add any other features, like the Miniature Butterfly Koi and any plant materials, logs, or rocks you want to include. Miniature plants on wire stems are easily inserted into the floral foam to hold them in place on the base of your water feature. To create the effect of deeper water in a model scene you can add colored layers of 'water' to the areas of your water feature or pool where you want the illusion of depth. The easiest material to use for this purpose is clear acrylic artist's medium. I prefer to use a type of medium called "tar gel" which is thick enough to drip to create miniature waterfalls and running water textures, but you can use any acrylic medium which dries clear. If you don't want to try acrylic artist's mediums, gloss acrylic varnish will work as well. You can even use clear acrylic floor polish. To color acrylic paints, varnishes and floor polishes you can use strong watercolor. Tube watercolors work best and have the finest pigments to keep from clouding your water effect. Mix the color a small amount at a time, into your tar gel or clear medium. When you have a color you think will work (hopefully not too well mixed, so there will be streaks, like in natural water depths) apply your colored acrylic to the areas you want to appear darker in your finished pool. See the photo above for the layer of tar gel applied to the back wall of my miniature koi pool. Here's my dolls house scale koi pool, ready to add the water surface layer. You can see here how the layer of 'tar gel' has dried to a deep blue-green 'slime' which will work well for the effect of deeper water in this part of my pool where I am planning to have a stream of water enter the pool over the edge of a rock. All the landscaping elements are securely glued in place in the pool. Once I finally glue the water surface in place I won't be able to adjust anything in the pool, so I need the scene to be stable, and dry. The water surface for these types of model water features is made from a thin sheet of clear styrene or acrylic. Choose a material which will not sag across the width of your water feature. Most model shops and picture framers stock thin clear sheet styrene (for models) or acrylic sheet (for unbreakable photo frames). You will need a piece of clear sheet plastic which is slightly larger than your water feature. Water naturally creates its own level, so it is very important that a natural level is created when you make a scale model water feature. If you are making moving water, rivers or creeks, you need to tilt the surface of your sheet slightly to give the water surface the effect of running downhill. 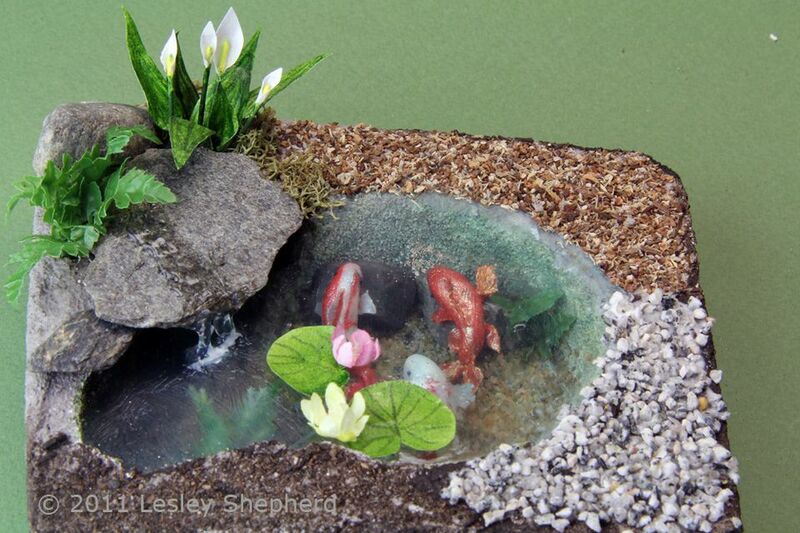 As I am creating a miniature pond, I need my water surface to appear flat and level. Use your trimmed sheet of clear plastic to mark a line around the edges of your pool where the natural level occurs. If your foam pool is carved with a flat top, you may have a level water feature when you lay the clear sheet over the top of your pool. If your water feature is not level, use the edge of your pool surface sheet to mark the level on the sides of your pool and cut a slit into the edge of the pool along the level line. You will insert your pool surface into this slit and landscape over it to create the effect of a level water feature. To create a realistic model and miniature water features, you need to get the surface of the water right. Many modelers simply rely on heavy texturing of materials such as silicone caulk to create water surfaces, but this is not suitable for realistic detail. With a clear flat surface to work on, you can create very detailed textures to show fast or gently flowing water, still water, or ripples where items have been thrown into or out of a pool. These surface effects are much easier to do on sheet plastic, than with other methods of making scale water. To make the textured surface for my koi pool, I wanted an area of fairly still water above the koi so they can be seen clearly, but I want to simply run and moving water in the area of the pool near where I will have a small waterfall feeding the pool. Using thick acrylic medium and a stiff brush, I brushed ripples onto the surface of my clear plastic, roughly where I want the effect of moving water to be. Take a close look at real water features to see how the water looks as it is moving. Photographs rarely show the correct 'shape' of the water. When you have your ripples roughly where you want them, set your water surface aside to dry in a dust-free location. Don't apply too thick a layer of acrylic medium (or varnish) to make your ripples, you can always add more (or smooth out too many) later. To further add to the realism of scale model pools and water features you can add color to the textured surface of a flat styrene or plastic sheet. In this photo you can see how a thin coat of Pebeo Vitrea glass paint has been brushed onto sections of the textured plastic pool surface, creating the effect of dappled water. The areas where the water needs to be clear to enjoy the koi in the pool below have been given less color than the rippled water sections which will be near the waterfall. In this case, a mixture of green and blue colors ​was used on the surface. To make the most realistic effects, use light layers of color and check between applications to see how your water surface layer compliments the landscaping you did on your water feature. If you still need darker areas of water, you can add more color to the top surface to give it the effect of dark water beneath. You have the option of using glass 'stain' paints or markers on either side of your clear plastic water surface to give even more of a layered effect, just check that the paints or markers you use do not destroy or cloud your clear plastic. Test them on a scrap of your water surface materials before you apply them. Although you can continue to adjust it, you should check the textures and colors of your water surface sheet in relation to the landscaped base of your model pool. Lay the colored and textured plastic sheet over your landscaped pool base to check that the water has the depth and textured appearance you want. Don't panic if you can't see into your pool the way you expect. You can make minor adjustments even after the pool surface is glued into position. At this point of your modelling, you should check that the sides of your pool show the effects of light entering the water (lighter at the top in shallow areas) and that the pool looks to be made from the material you intended (my mimics your common garden variety concrete pool, which is disguised everywhere but on the sides, where only green algae will grow). Once you've checked your final watercolor and texture over the top of your model water feature it is time to secure it in place. Make sure all the contents of your water feature are securely glued and all paints and glues are dry. If you cut a slot in your foam to help you level the surface of your water, slide your sheet of textured plastic into place into the slot. Glue any edges which are on the top surface of your water feature to the flat areas of your foam as shown. If necessary weight them in place until the glue dries. Depending on the type of plastic sheeting you use, you may want to use a heavier glue than your normal craft PVA glue to hold the water surface in place. I used jewelry type PVA glue for my pools as they are a bit more elastic and thicker than regular glues. Silicone caulk and silicone glues will also work as well, but avoid any which are highly acidic. Your pool is a closed system, and acidic glues may cause it to discolor over time. When the glue has dried to hold your water surface in place over your model water feature, you can cover the exposed edges with your chosen landscaping material. I use a glue spreader to apply glue to the edge of the modeled water, just where it meets the 'bank', and back over the area to be landscaped. I can then carefully press on a layer of dried coffee grounds, dried sterile potting soil, sand, or another material to cover the edges of my plastic pool. If you are working with thicker types of sheet plastic (Plexiglass for example) you may need to use a filler to blend the edges of your pool into the terrain you made from floral foam. If necessary, you can glue thin layers of floral foam over the top of the pool edges and your surrounding landscape. If you have to add on floral foam, make sure you glue it together with a thin layer of glue. Otherwise, you may have difficulty inserting landscaping materials (trees, bushes, plants) through the dried glue layer. For most areas where I will be "planting" a landscape, I cover the edge of the pool with the same basic 'earth' color I use to prep the surface after the application of gesso. This saves me from needing to work the plant material through a layer of glued sand or soil. You can see in this photograph how the end of the pool which was designed to be deeper, now has that appearance, as well as a suggestion of moving water. The pool is the same depth across the entire model, paint and surface techniques have given one end the effect of being much deeper, with moving water. With your model water surface in place over your landscaped miniature pool or stream, you may notice areas where the surface ripples are too pronounced, or where the view of the pool is obscure and needs to be clearer. You can take the water surface back to a clearer view by adding a self-leveling layer of acrylic varnish or clear acrylic floor polish to areas of your water where you need less texture to enhance the view of the water. You can also add more acrylic medium to create heavier ripples for rapids, or make ripple effects that mimic items passing through the water surface. To add splash marks to the surface of a model water feature made with a clear plastic sheet, you can remove areas of the surface texture to leave behind a circular ripple. In this pool, you can see a ripple which was formed by applying a small amount of water to the almost dry surface of the textured pool. Where the water softened the acrylic, it was removed with a bit of paper towel and a cotton but, so that a depression with a surrounding line was left on the water surface. You can achieve the same result by building up your water surface layer with a brush leaving a circular area without the build up if you prefer. With a pin, you can add small water droplets to areas surrounding the pool, to imply a fish has just gone beneath the surface or flashed its tail. My favorite part of creating model pools and water features is adding details that suggest running water. These are much easier to create with artist's acrylic mediums than with any of the commercial modeling materials. My favorite material for these features is Tar Gel Medium. When the tar gel had completely dried I added a bit of frosted glass stain to the base of the waterfall to mimic the action of foaming water. Unlike silicone, which dries to a tacky surface and often attracts dust, tar gel dries clear and firm but remains flexible. It is great for wet footprints and spilled water effects as well as it can be teased back up into 'frozen moments' splash lines. You can use this technique for any type of model water feature, but it is especially effective with the type of model water feature made from simple sheets of plastic shown here. Much easier than a lot of chemical faux water mixes. If you wish, you can add miniature water plants to the surface of your model pool. The easiest to add are water lilies (a tutorial is coming!). Although water lilies grow from stalks, they prefer growing in still water, and the stalks are not easily seen from above. The leaves of water lilies, with flowers glued to the edges, can be placed on the top surface of a pool in an area of still water where they can be very realistic. Water lilies and other surface plants are also a good way to disguise any imperfections in your pool surface. Their bright color can create focal points, and draw attention to hidden details, like the koi rising to the surface in this photo. Planning is everything, and of course, I'm sure many of you are wondering why the koi in my pond are facing away from my attractive waterfall feature. Knowing the details of real life help to make it realistic when you create a miniature version. Koi are very sociable but tend to hide out until a food source appears when they suddenly become very active. To show off my miniature koi, I want them coming to the surface of the pool, so I need to create a feeding scene or they will just appear static, mildly interesting, but without the realism I love. I want to be able to view the koi, the waterfall, and the fish feeder, so the koi need to be facing where the person who feeds them will appear. I've added some 'fish food' pellets made from unmelted bits of embossing powder to give the koi an excuse for appearing to rise to the surface. Tiny drops of tar gel near the embossing granules make it look as if the food has just splashed into the pond. Try to work out a view with some type of action whenever you are using animals or moving features in miniature scenes. You can create a much less static scene with a bit of planning. Here's a view of the finished koi pond, ready for its final landscaping into a dollhouse scene. With the doll standing behind the pond, you can see all the details I want the viewer to notice, and why the koi were set on the far side of the pool facing away from the viewer. I want the viewer to see the fish being fed, rather than notice the back of the doll that feeds them. In this view, you can also see the effects of three different types of landscaping materials used around the edges of the pool. Budgie grit or gravel makes a useful fine gravel surface for paths, fine sawdust blends (you need to use two colors, to mimic the effects of bark) can create bark pathways or real soil glued to the floral foam surface can give the effect of manicured flower beds. As it is made from floral foam, this pond can be set into a larger landscape made of foam, or it can be set up as a 'raised' bed in a corner of the garden and blended into the scenery with more bits of floral foam and pebbles.